The new $68-million Hatfield-Dowlin Football Complex at the University of Oregon in Eugene, OR, boasts 145,000 square-feet of high-end training space for the UO Ducks football team, including AV amenities normally reserved for professional athletes. To deliver clear, flexible, campus-wide audio, video and control, integrator CompView selected top-shelf equipment, including products from Planar, Biamp Systems, and Crestron. The enhanced audio in the facility's training center heightens players' motivation during weight sessions and on-field practices by sending music and crowd sounds throughout the entire facility. Linked by CobraNet throughout the complex, staff can easily adjust content and audio levels from a range of different access points. The Hall of Champions at the entrance of the Complex is outfitted with a Dutch acoustical ceiling, 3D sound, and a 64-screen video wall that greets visitors with a mosaic of inspirational 4K videos and stills, plus live sports broadcasts. Crestron DigitalMedia is at the heart of the control and distribution system. Project representatives stated that Biamp ensures robust sound delivery for every videowall, signage panel, and projector within the center's theaters, meeting rooms, locker rooms, and cafeteria. To further enhance athlete training, AudiaFLEX turns the facility's practice field into a stadium-like experience by blasting 115 decibels of crowd noise. Using Biamp’s Nexia CS, coaching staff can participate in videoconferencing sessions. Planar's Clarity Matrix was chosen for this space based on its ability to accommodate a key architectural element of the center—an L-shaped wall that would create a dramatic focal point in the lobby. Planar representatives believe that the selection of the Clarity Matrix reflects a growing trend in higher education: the use of architecturally-grounded video platforms to create maximum interest among target audiences and to better connect them with the mission, values, and culture of an institution. 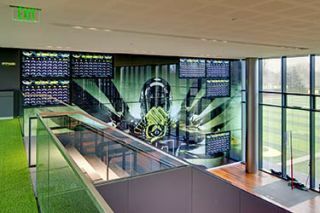 The Clarity Matrix video wall was specified to show a variety of information, including University of Oregon branding content, clips of Oregon football games, sports programming and live game footage. Clarity Matrix offers eco-friendly LED backlighting, 800 nits of brightness, a 3500:1 contrast ratio, and over 132 million pixels. “All of these combine to provide a picture that is stunning whether viewed close-up by someone in the lobby or by passersby right outside or even a block away,” Firm151’s Stegmeier says. “Without question, the Planar displays help us to share the vision and philosophy that is Duck football. Whether the focus is based on teaching, recruiting, motivation or analysis, the Planar systems help us to assist our current players to improve and furthermore to attract future top performers into our program,” said Jeff Hawkins, Oregon’s Senior Associate AD for the football program.